Music Technology focuses on studio recording techniques together with creative arranging and composing, making use of computer software. You should have a strong interest in 20th-century popular music and an aptitude for both music and IT. Music Technology involves a large volume of practical coursework, encouraging you to cultivate many skills. You’ll have opportunities to sequence MIDI and audio, record live instruments, and produce professional quality mixdowns of your work. To study Music Technology at Bilborough, you do not need any previous experience or qualifications, but you must have the passion, enthusiasm and commitment to quickly learn a new subject from scratch to a high standard. Experience of music theory and modern music technology software on Mac or PC would be advantageous though, as would be the ability to play a musical instrument. Some students opt to take both Music and Music Technology. This is a sensible choice if you are musically very able and intend to continue studying music in higher education. It is always good to consult the specific entry requirements of individual universities first. Our A-level in Music Technology can lead to further study in Music, Music Technology or Performing Arts at Higher National or degree level. It may help you on your way to a career in the music industry or to a technology-orientated career. You will use production tools to record, edit and mix a track from a choice of 10 set by the examining board using 7 different instruments. Detailed practical training will be provided over the 2-year course enabling students to produce professional quality recordings. You will use recording, sampling and synthesis techniques to produce an original composition based on a choice of 3 briefs issued by the examining board. Students will be taught the skills of writing and developing musical ideas alongside key technological functionality to support creativity. You will apply knowledge related to all three areas of study (below) to a series of unfamiliar recordings. At the end of the 2nd year you will use your knowledge and understanding of editing, mixing and production techniques to correct and combine audio and MIDI materials into a completed mix. Written work in the exam takes the form of short answer questions and extended essay responses based on the 3 areas of study mentioned above. Many Bilborough Sixth Form College students have progressed to prestigious higher education courses such as the University of Surrey’s world famous Tonmeister™ Music Technology degree, and courses at the Liverpool Institute of Performing Arts (based in Paul McCartney’s old school) and the School of Audio Engineering. 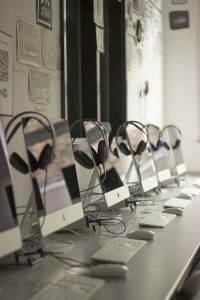 Music Technology students also take up places at specialist music conservatoires such as the Royal Academy of Music, Trinity Laban Conservatoire of Music and Dance and Leeds College of Music.